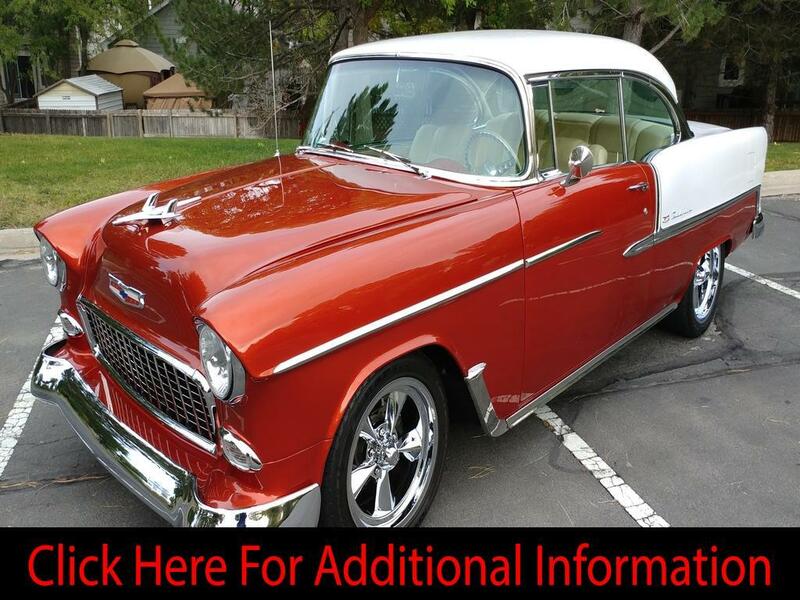 1955 Chevrolet Bel Air 2 Door Hardtop Resto Mod, 383 Stroker Crate Motor, Est. 4,500 Miles, THM 700 R4 Rebuilt Transmission 3-Speed Auto w/Overdrive, 4-Bolt Main-1 Piece Rear Main Seal & 10 to 1 Compression, Dynode at 420 HP w/450 Ft. Lbs. Balanced within 2 Grams! Aluminum Perf Heads, Air Gap Manifold w/New Holly 650 HEI Distributor, Sanderson Headers & Magna Flow Mufflers, Polished & Clear Coated March Serpentine System, upgraded 140 AMP Alternator, Vintage Air/Heat defrost w/Stock 1955 Controls & Upgraded AC Lines! C4 Corvette Independent Rear End Completely Rebuilt w/New Bushings, All Wheels Hydro Boost Power Disc Brakes, New Brake Lines Calipers & Rotors. Front End is Heidts Coil Over Shocks & Saginaw SSPC 5050 Gear Box & Pump. New 70 Amp Relay with Style 40 Cooling Fan & Shroud, New Gas Tank w/Straps & Sending Unit. Rain Gear Electric Wipers w/Under dash Mounted motor, Front & Rear Seat Belts, Lokar Shifter, New Stainless-Steel Smoothie Bumpers, Protective Under-Coating of Entire Under Carriage & 17’ USA Mags- Chrome 5 Spokes Wheels & Hercules Raptis WR1 Tires=F). 205/50R17 & R). 245/45R17. Kenwood CD Stereo W/Amp. Beautifully Painted in Glow Orange Pearl & Diamond White. Two Tone (Beige & Off White) Leather Interior with hand Stitched Orange Accent- this Resto Mod has Won Numerous Local Car Show Awards and Looks as Cool as it Drives! Car was Appraised in 2013 at $72,000 before additional Upgrades have been added by current owner. Please No Trade Offers, No Broker or Marketing Calls! SMS Text Messages will not be answered-too many scammers! Showings are by Appointment ONLY for Qualified Buyers! Please have your Financing set up BEFORE you ask for a Viewing of the car. Call 72066030sixtwo. Additional info at nextstepprosales dot com Marketing Company for Private Sellers-This is a Private Sale-No Sales Taxes are Collected. If you see this Ad, Then the Car is Still For Sale!